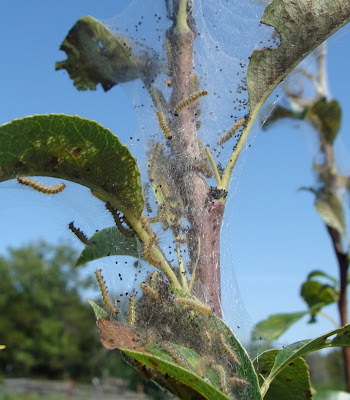 One of the pear trees has been colonised by these tiny tent caterpillars. Well, they're tiny now, but if they keep going like this I imagine they'll soon be enormous. 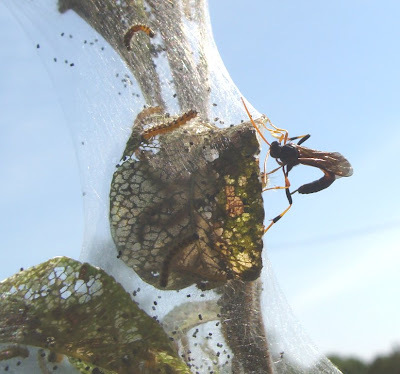 As we stared in horror at the denudation of the top growth of the tree, Mike noticed that a rearguard action was being fought by a parasitic wasp which was busily laying its eggs in the caterpillars. Good to know we've got an ally! Egads, those pictures of the caterpillars are disturbing. Good luck!